What Happens When You Damage a Tooth? We can damage a tooth in a number of different ways. Sports injury, or even biting gown on a hard piece of food, could crack or chip a tooth. Likewise, teeth grinding could wear down your teeth and increase the risk of chips and fractures. Untreated cavities could weaken your teeth, making injury more likely. When you damage a tooth, even if the breakage appears minor, this could enable bacteria to move past the protective layer of tooth enamel and reach the dentin within. A cavity then forms, one that unless treated will continue to grow and expand until you suffer an infection or possibly even an abscess. Bonding and contouring are two separate procedures, but we may perform both in the same visit. Bonding involves the use of a composite resin to repair a tooth. 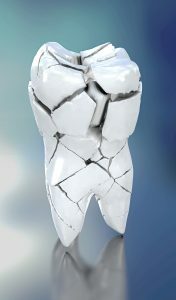 We remove any decay and clean the tooth. Next, we shade the composite resin to match your tooth. We apply the material in several layers, shaping the tooth as the composite resin cures under a light. Finally, we polish the tooth for a more natural appearance. In addition to repairing chips, we also close gaps between teeth and even mask permanent teeth stains. Contouring involves buffing away a small layer of tooth structure. Again, we can use this to address minor chips, as well as misshapen teeth and even overly pointed teeth. If you have issues with the surface of your teeth, such as embarrassing grooves or pits, contouring can help remove them. In a single visit, we can offer a natural looking solution to minor damage! Following treatment, try to take steps to safeguard your smile. When you play sports, be sure you wear a mouthguard. Even better, talk to your dentist about creating a custom one that fits more comfortably and protects a greater level of protection. You should also avoid chewing on ice or objects such as pens or pencils, as these could potentially damage your smile. Does Your Smile Need Repair? Our team offers a single visit solution to minor damage, restoring the heath, function, and appearance of your smile. To learn more about our approach to cosmetic dentistry, schedule a consultation with Smith Family Dentistry in Greenville, TX call us at 903-455-5750. We proudly serve patients from Hunt County, Greenville, Royce City, Sulphur Springs, and all surrounding communities.